Carrot cake sounds like a healthy dessert, but most carrot cakes are loaded with fat and have over 600 calories a slice. So when Good Housekeeping published a healthy makeover carrot cake recipe with only 210 calories a slice, I had to give it a try and I wasn’t disappointed. It’s a great recipe, moist and delicious. I have made this cake twice before in the recommended Bundt pan with great results, but this time I wanted to try it with Picky Palate’s fabulous Toasted Coconut Cream Cheese Frosting, giving it more of a tropical flare. I baked it in two 8×8 baking dishes for 30 min. 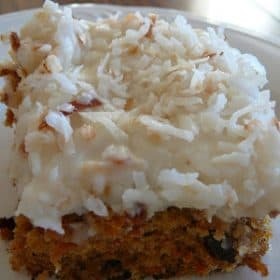 The frosting is absolutely delicious and I love it on your coconut cupcakes, but it is too sweet for this carrot cake – but that didn’t stop me from having a second piece yesterday and two pieces today. Good thing I didn’t make the full fat version! Preheat oven to 350 degrees F. Spray nonstick 12-cup Bundt-style pan with nonstick cooking spray with flour. Prepare cake: Combine flour, soda, cinnamon, ginger, baking powder, and salt. In large bowl, with mixer on medium speed, beat eggs and egg whites until blended. Beat in sugars; beat 2 minutes. On low speed, beat in pineapple with juice, oil, and vanilla. Add flour mixture; beat 1 minute. Stir in carrots and raisins. Pour batter into pan. Bake 45 to 50 minutes or until toothpick inserted in center comes out clean. (Don’t over cook.) Cool in pan 10 minutes. Invert cake onto rack; cool completely. Prepare icing: In bowl, stir cream cheese and 1/4 cup sugar until smooth. Add milk, vanilla, and remaining sugar; stir to a drizzling consistency. Drizzle icing over cake. Hi Carol – Thanks for letting me know you’re making the cake. I’ll look forward to the post. Hope it was delicious! I posted the cake today! It was delicious. I made a few changes. Doesn’t every baker add their own touches?? I linked bake to you for the credit! Now I am going to have to try your buttermilk biscuits!! This is my new go to site Barbara!! This looks delicious. It’s my husband’s favorite cake, so I am always searching for new recipes ideas. Thanks for sharing. My daughter loves carrot cake, but I always hesitate to make because of the calories. Thanks so much for this recipe! Carrot Cake is Grumpy’s favorite! The cake looks delicious! Thanks Jenny and Priscilla. The older I get the more I like carrot cake. This looks delcious! I never knew your average carrot cake had “that” many calories in it! Oh this looks terrific Barbara! I love carrot cake, really beautiful!